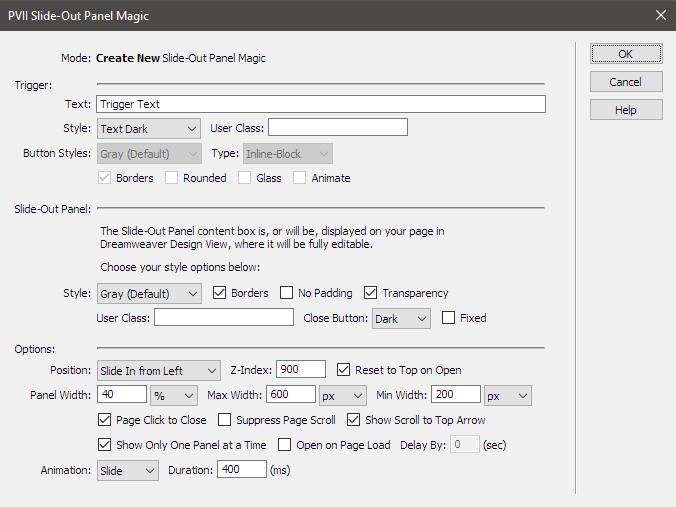 Slide Out Panel Magic (SOP) allows you to create one or more responsive and adaptive slide-out panels on your page.. The SOP interface allows you to configure, style, and set options for each panel you create. Panels can contain images, text captions, text content, forms, other PVII Widgets, PVII galleries and slide shows, or any other type of content. SOP panel content is fully editable in Dreamweaver Design View! Slide Out Panel Magic gives you total design freedom... with tons of power, style, and flexibility. What can it do? View the Example page to see what Slide Out Panels can do. Pop up a Sign Up form, a Slide Show Gallery, or anything you can imagine. Reset panel content to top when a panel is reopened. Suppress Page Scroll while panel is open. Show Scroll to Top Arrow in Panel. Set your Panel to appear from the left or right side of your page. Choose from several engaging animation options. Create as many Slide Out Panels as you want on the same page! Panel content is fully editable in Dreamweaver Design View. Panels can contain any type of content you need: plain text, images, forms, videos, other PVII widgets, and more. Add as many instances as you want to your page and style each one independently. Responsive, mobile-friendly, and adaptive. SOP will always ensure that your Panels work on all devices—automatically. Set a unique Width, Max-Width, and Min-Width for each Panel, knowing that SOP will handle the fit for all devices by making adjustments where and when necessary. Use existing links and images for triggers, or have SOP create the links for you. The links can be anywhere on your page. Style trigger links automatically in the SOP UI. Choose from several themes and attributes. Trigger links can be styled text or buttonized, displayed inline, or blocked on separate lines. Style your Panels from several available themes and attributes. Triggers and Panels can be assigned a User Class of your choice in the UI, allowing total design flexibility. Choose a light or dark close button, positioned at the top right corner of your Panel. PVII Slide Out Panel Magic is an indispensable tool that will make your job and your life a lot easier.